Pricing, just like Netflix content, can vary wildly around the world. Netflix’s business is booming as it adds millions of new streaming subscribers. But there’s one part of its business that’s barely holding on: DVD rentals. 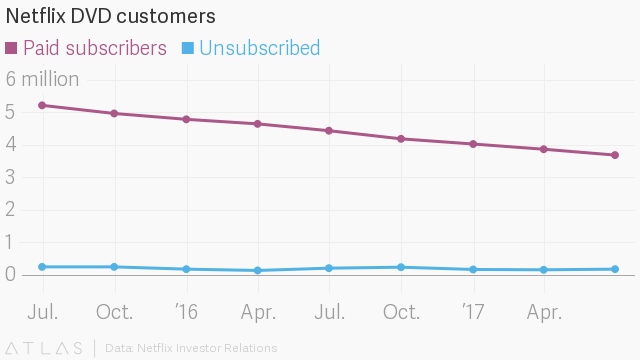 According to its second quarter results, Netflix has nearly 3.7 million US customers paying for its DVD-by-mail service—an anachronism that predates its streaming video service, and only exists because about 34 million Americans still lack broadband internet access. That lack of access is a major reason why DVD rental outlets (including a few Blockbusters) continue to exist in America’s heartland. Sure, you might have the hardware needed to stream Orange is the New Black or Jason Bourne, but living somewhere like Wyoming means you probably won’t have enough bandwidth. Netflix’s DVD customers are probably going to be around for a while. Over the last couple of years, even as TVs and streaming devices get cheaper, there hasn’t been a dramatic spike in the rate of people moving away from the service. In fact, it could easily weather several more quarters of soft decline.